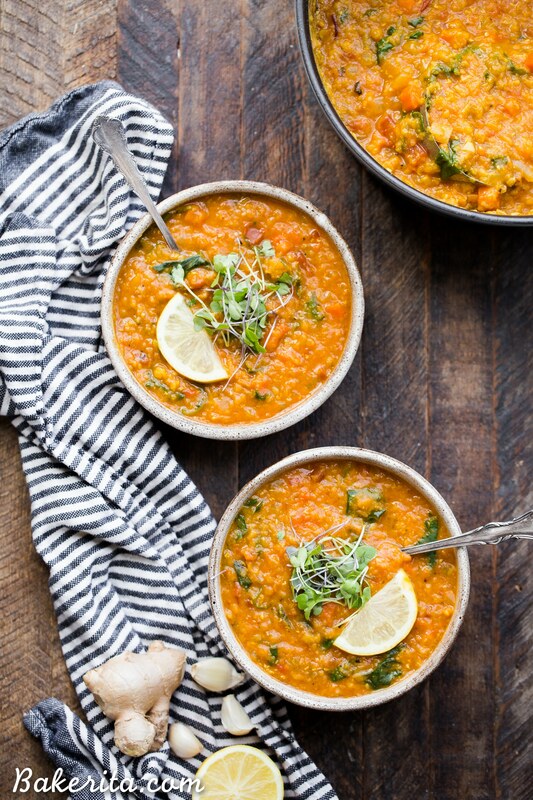 This spiced Vegan Red Lentil Soup is a warm, comforting meal that comes together in just 45 minutes. It’s full of flavor from ginger, garlic, and spices, with a luxuriously rich texture. It’s perfect with a squeeze of lemon to brighten things up! Happy Monday! Hope you guys had a wonderful weekend :) I let myself take a weekend-work break (which doesn’t happen too often…even though I guess I am writing this on a Sunday) and it was so nice. I hope yours was equally relaxing and rejuvenating. I’ve been long promising more savory recipes, and I’ve come through a few times, but I’ve definitely not gotten as many savory recipes on this site as I’d hoped. I’m actively working on changing that because I’ve chatted with you guys, gotten comments, and emails, and taken Insta polls, and you guys definitely want MORE healthy, easy, savory meals. And I want to make you happy! I’m also actively working on upping my cooking skills. I’m a pretty good cook, but I feel much more comfortable developing dessert recipes than I do “real-food” recipes. I never want to give you a recipe I’m not stoked on, and I can be a bit of recipe perfectionist. It’s so hearty, thick, and absolutely delicious. I’ve been eating bowls of it all week and I’m not sick of it yet. It’s filling, without being heavy, and rich without being too much. You can also blend half of it to make it a little more rich and luxurious, which is what I did or leave it be if you want it on the brothier side. Even if you do leave it be though, it’s still hearty and stick-to-your-ribs good. 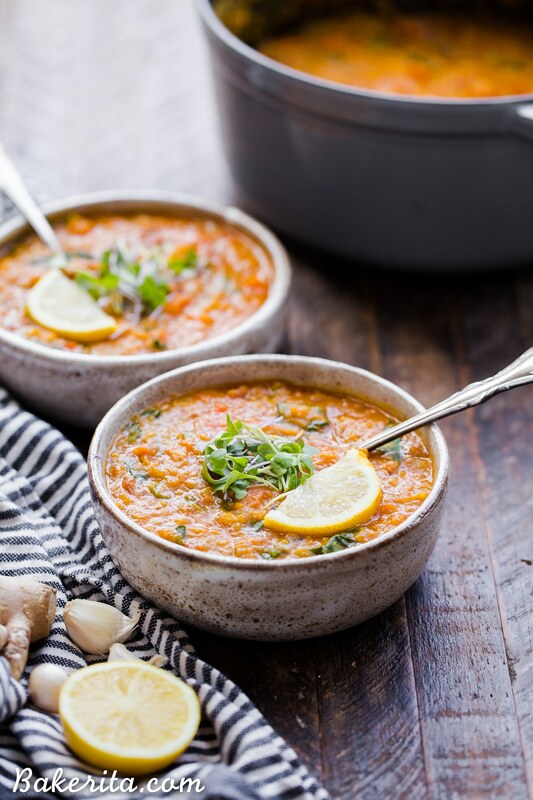 It’s got a major flavor dose from fresh garlic and ginger, and a few key aromatic spices take the flavor to the next level – a hearty dose of turmeric, ginger powder, cumin, and garlic powder. It doesn’t take too long to come together either. Most of the work is front-loaded, and then you’re just letting things simmer until the lentils are soft. A quick stirring in of some greens and a squeeze lemon finishes it off, and you’re ready to devour. 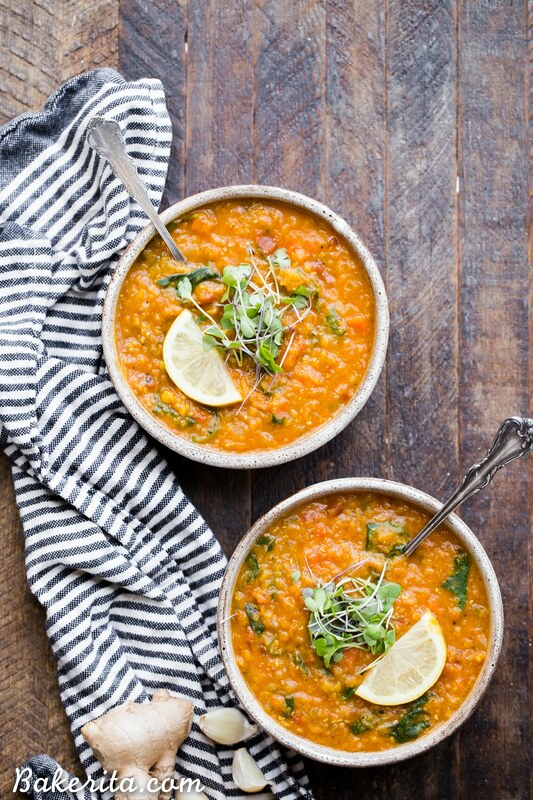 This spiced Vegan Red Lentil Soup is a warm, comforting meal that comes together in just 45 minutes. It's full of flavor from ginger, garlic, and spices, with a luxuriously rich texture. It's perfect with a squeeze of lemon to brighten things up! In a soup pot, heat the avocado or olive oil over medium heat. Once the oil is shimmering, add the onion, carrot, and celery and cook for about 5 minutes, until the onion is translucent. Add the garlic, grated ginger, cumin, turmeric, garlic powder, ginger powder, and salt, and stir to combine and coat all the veggies in the spices. Let cook for 2 minutes, until fragrant, and then add the vegetable broth, water, tomatoes, and red lentils. 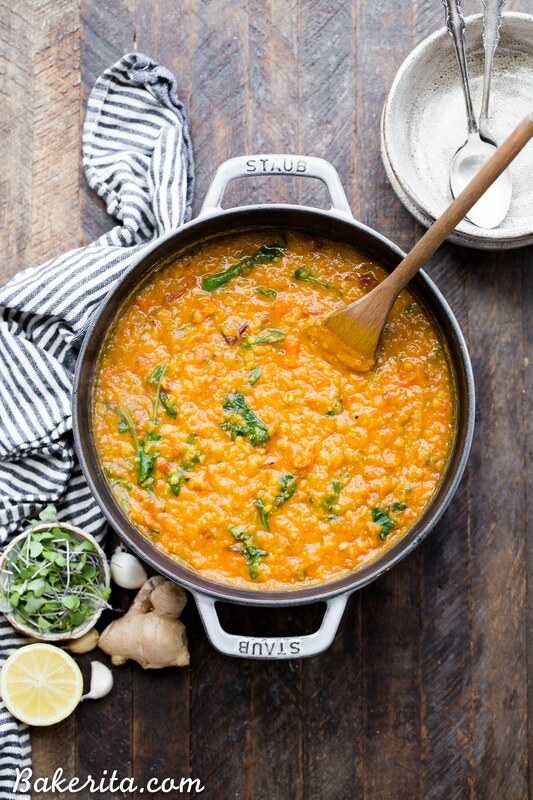 Stir and bring to a boil, then turn down and let simmer for 30-40 minutes, until the red lentils are soft. Taste, and add more salt to your tastes if desired. If desired, puree half the soup to help make it creamier. You can also just leave it as is if you prefer a more broth-y soup. I pureed some of mine with an immersion blender. Stir in your greens and let them wilt, and then add in lemon juice and zest. Serve with more lemon if desired (I recommend), and garnish with some microgreens! Yum! This looks great! I will make this for my lunch rotation. Holy cow I’ll make it soon!!! I’m allergic to celery though so what can I do instead? This looks DELICIOUS!! I’ll definitely be making it for dinner tonight! It’s perfect for the cold weather we’re still having in NYC! Oh yes, I hope that you absolutely adore it Angelina! Enjoy!! Hi Alexia, more will be coming along soon too! I hope you love the soup. For me, it lasted a week in the refrigerator. It also freezes well! Just made it it was delicious ! I added some chili and a bunch of fresh cilantro at the end. love this recipe, its perfect! So glad you’re loving it Eva!! So happy to hear it was a hit! Thanks for the feedback, Arc. Perfect soup for the slowly cooling San Diego holiday season. We loved it, esp with the lemon kicker. Served with fresh sourdough bread! This soup is DELICIOUS!!!! 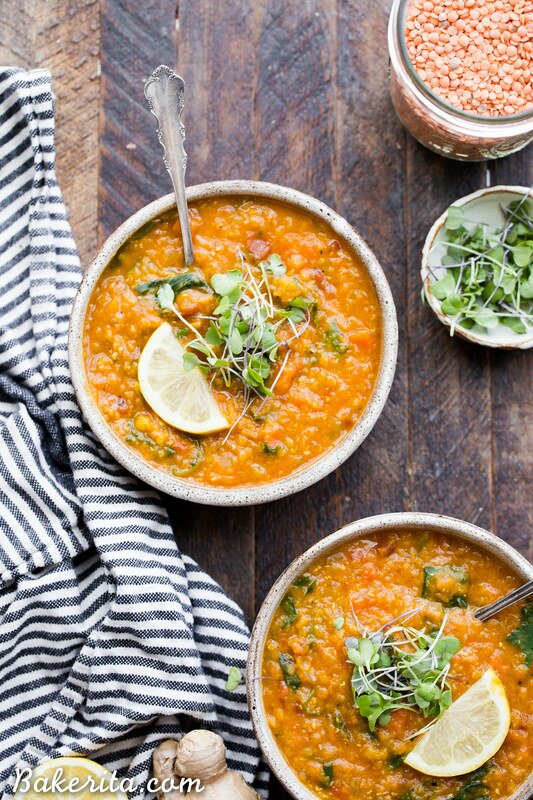 So easy to make, so flavourful, so healthy! I love it! :) I didn’t have any celery or carrot but I threw in a few peppers and it worked out perfectly. I’m definitely making this again, and I might amp up the spice measurements as I love things spicy! Made this last night,pureed part of it so it had a nice creamy texture but still some structure. Delicious, makes enough for leftovers. Would recommend this as a nice cozy meal on a cold evening. Next time I might toast the spices first to bring out ore of their flavor. The first time I made this soup it was a snowstorm, such a perfect day for making this hearty soup. I followed the recipe exactly. The Indian spices offer a nice flare. I blended about 3/4 of the soup and left the rest unblended for an added dimension. This is really nice. I shall definitely be making it again. This time I had to make a few adjustments because I didn’t have all the ingredients — extra garlic and ginger instead of the garlic and ginger powder; bottled lemon juice instead of the fresh lemon juice and zest; and frozen spinach — but it still turned out really well. So thrilled you enjoyed it! I made a batch last night too :) thanks for sharing your feedback. Great recipe! I made two batches of this last night. I sauteed the veggies in water instead of oil because we are trying to go oil-free in our diet. It turned out just fine without the oil (you just have to keep your eye on it and add water as necessary). When it was done, I was too hungry to wait for it to cool down, so my husband suggested I add a “lime cube” to my serving (we freeze lime juice in ice cube trays). That cooled it down and added some really great flavor, too! I might intentionally add some lime juice next time I fix this. And there will be a next time. We really enjoyed it! Glad I doubled it. We are freezing the 2nd batch. So thrilled you and your husband are loving the soup, Nancy!! Love your idea of lime cubes – sounds so tasty. I need to start doing that. Just made this. I looking for a recipe for lentil soup after buying a packet of the soup at Trader Joes. This came out great! So yummy, light and wholesome. So thrilled you’re loving it! Thanks so much for the feedback. Absolutely delicious!!! Made without the garlic powder as I didn’t have any and I added an anchovy and some chili flakes. Incredibly tasty and will last me all week. Will definitely be this making again!! Really, really good. Very flavourful and presents well.